Looking to insert or embed Adobe Captivate content into your WordPress site? 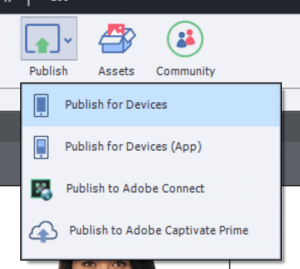 In this article, we’ll show you how easy it is to publish content from Adobe Captivate as a .zip file and upload it to your WordPress website. In the dialog box, ensure “Zip Files” is checkmarked. The WordPress Plugin that we’re going to use only needs your published .zip file. This makes it really easy to upload your content to WordPress. Looking to insert or embed Articulate Rise content into your WordPress site? In this article, we’ll show you how easy it is to publish content from Articulate Rise as a .zip file and upload it to your WordPress website. Change the Export Type to Web. The WordPress Plugin that we’re going to use only needs your published .zip file. This makes it really easy to upload your content to WordPress.